On Sep 1st WLS visited the Hachirabo Science Center for Children and met ten eager and curious kids for Day 1 of the Rover Challenge - Shibuya. The children at this Rover Challenge event were a bit older than those at the previous event held in Sendai. 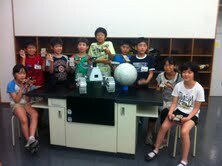 We all had a lot of fun and learned about some space science and engineering. All the kids got excited and curious about what the rover can do and which part of the moon the rover is going to land. As soon as they came into the classroom they immediately found the prototype rover and crowded around it. 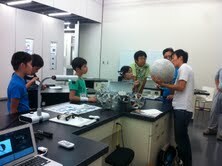 At the beginning of class WLS members answered questions from the kids and explained the challenge of the GLXP. After learning the challenges in going to the moon, the kids get to build their own kit rover. Some parts were a bit difficult, especially the gearbox, but everyone finished building their own rover. Most of them did not require any help. The kids really liked their kit and could not stop playing even when the class came to an end. We hope they enjoyed playing with it at home as they took it home and that they look forward to the following class on the 8th.